Helios EURUSD is a unique Expert Advisor based on the statistical analysis of price data. 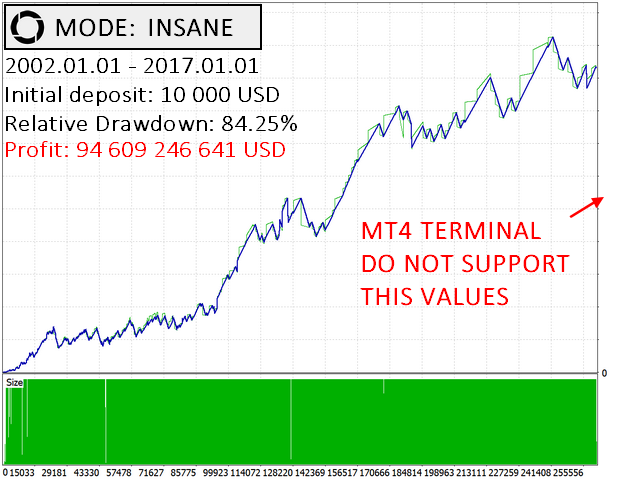 This version supports only EURUSD. 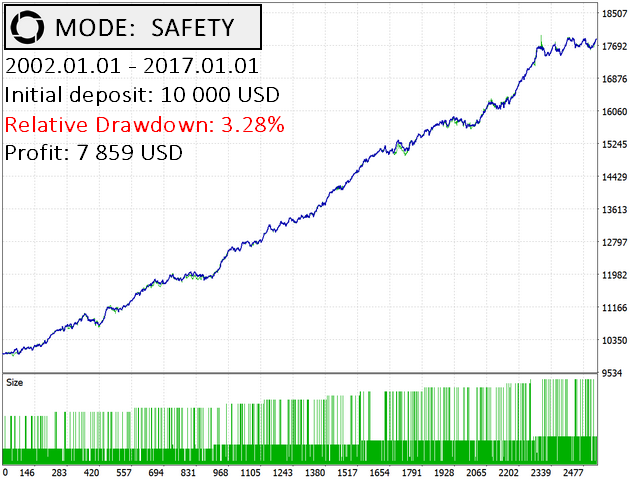 Also, unlike the full version, the risk management system works optimally for one currency pair, and not for six. Works with 4 and 5-digit quotes. 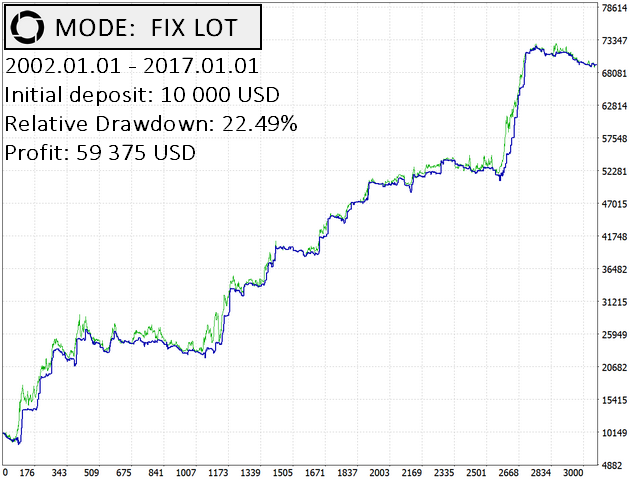 Option to trade a fixed lot. Artificial intelligence processes the statistical analysis data. No sudden loss of the deposit. No need to optimize - the genetic algorithm has already done it for you. Attach Helios to the EURUSD chart with the M15 timeframe. Configure risk, spread and slippage. Risk — risk management profile. Fix lot — fixed lot size. Works only when setting the "Fix lot" profile in Risk. Max spread — maximum allowed spread for opening a deal. If your current spread is greater than this value, the order will not be sent. Max slippage — maximum allowed slippage. The number of trades does not depend on the risk profile, it only affects the volumes. Thus, different profiles require different minimum deposit. It is recommended to use a deposit of 1000 or higher for Insane or Fix lot (0.01), up to 15 000 for Safety. If you do not have such a deposit, use cent accounts. 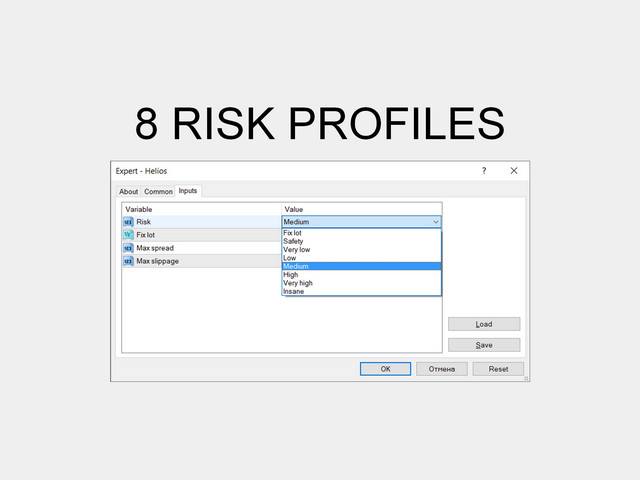 Profiles above Medium are profiles with increased risks. Therefore, be careful with it and reserve part of the profit. Helios works similarly to Devicore, but sets Stop Loss and Take Profit at different distances, which increases the profitability while decreasing the stability of profits. 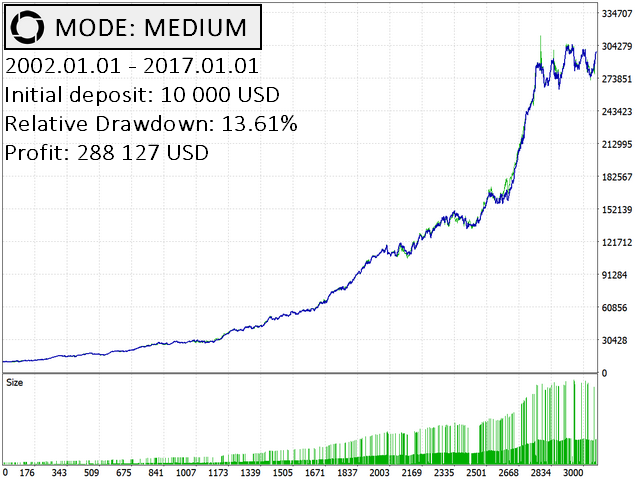 Be careful with the risk levels above Medium! The EA maximizes the profits at high risk levels, but puts the deposit at a greater risk. The EA is based on statistical analysis, so the trading results will approach the theoretical results only with a large number of deals (according to the law of large numbers). The EA may bring a loss one month and generate great profit the next month. Therefore, it is recommended to use it on 6 currency pairs simultaneously in order to increase the number of trades and to diversify income. 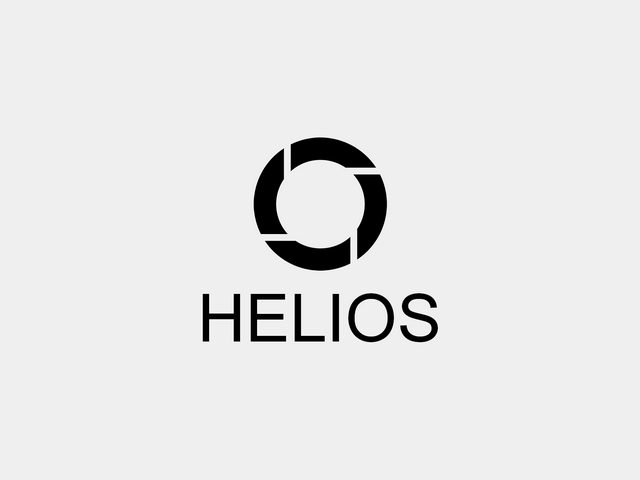 Helios opens 1-3 deals on one currency pair per week. The EA does not modify the deals and does not place pending orders, so it can be turned off at any time without harm. Please make sure that your account supports hedging. The EA is not based on hedging strategies, but it can accumulate multiple independent orders. When trading on one currency pair, prolonged stagnation is normal. 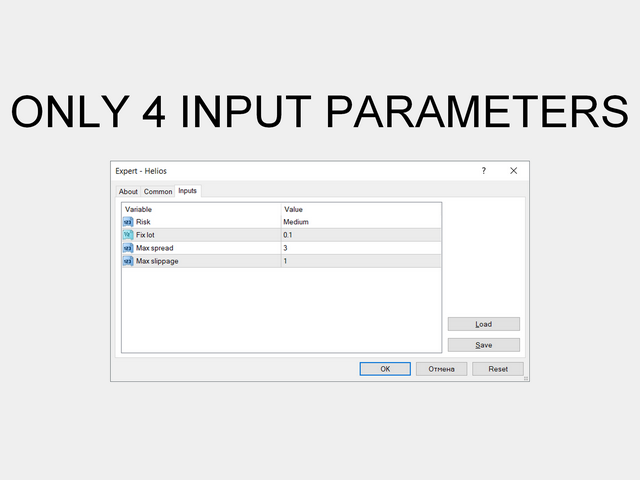 For a more stable income, use the full version of the product for 6 currency pairs. If you have any questions, please contact me. If you are interested in my other products, see this page. Отличные результаты! И серии «редко, но метко»!!! After one week working not a single trade opened, which makes me think it's one of those EAs that trade 3-4 times per month. Too slow for my taste.